I love baked oatmeal. You basically throw a bunch of yummy stuff in a bowl, mix it up, pour it into a casserole dish and bake it. In 30 or so minutes, you have a delicious hot breakfast that will feed a crowd. I made this last Sunday morning for my parents Bible study group. To make it special, I added chunks of apples and lots of cinnamon. The apples get slightly soft and sweet. It's so good and hearty. Starting anything with oatmeal and brown sugar can't be bad. 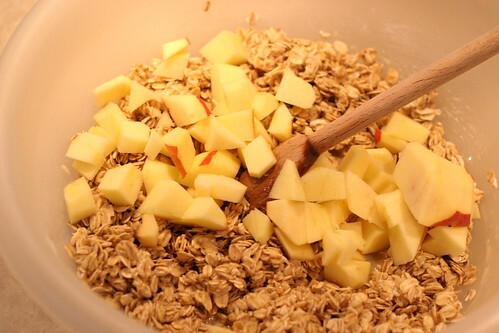 Throw all the dry ingredients in a bowl and then chop up some apples. Mix everything together and pour it into a casserole dish. Stick it in the oven and the scent of baked apples and cinnamon will make all the Bible scholars drool in the living room. 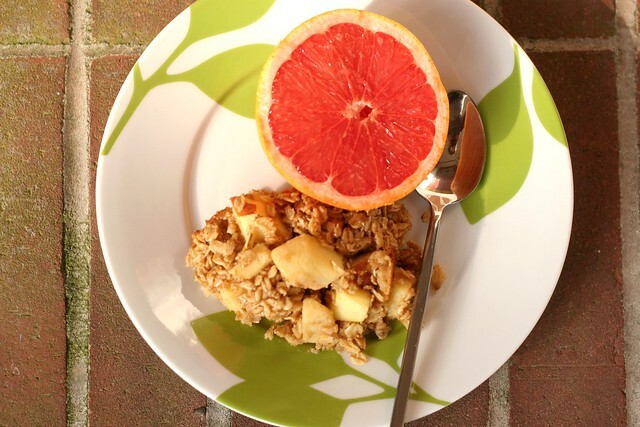 You could make this with pure maple syrup, any kind of fruit, walnuts... it's so versatile. I like it with apples and cinnamon. Classic. Paired with a grapefruit, it was a delicious and healthy breakfast that day. And it didn't leave me dreaming of buttery, rich cinnamon rolls. Except I'm always dreaming of buttery, rich cinnamon rolls. Is there anything better? Maybe chocolate croissants. Actually, I will take a chocolate croissant any time of the day. Especially midnight with a glass of milk. Okay I will stop now. Preheat oven to 350 degrees. Grease a casserole dish or 13x9 pan and set aside. In a large bowl, mix together oats, brown sugar, cinnamon, baking powder and salt. Beat in eggs, milk, melted butter and vanilla extract. 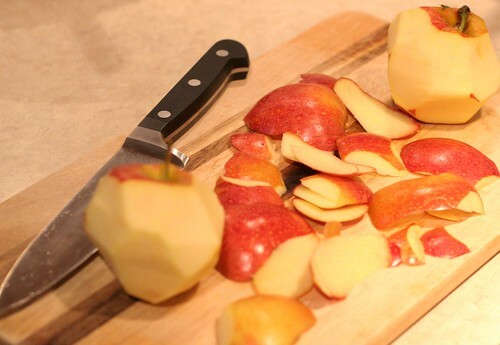 Peel, core and chop apples into small pieces. Add those into the bowl and combine. Pour mixture into baking dish. Bake uncovered for 30 - 40 minutes, or until golden brown on top. Serve immediately. YUMM! 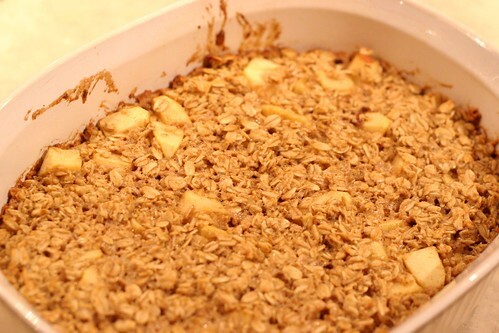 I love baked oatmeal :) esp with bananas or blueberries!! This really intrigues me. I've never heard of baked oatmeal before. 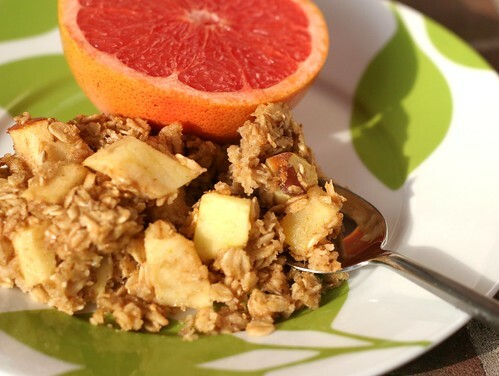 It looks thicker and crunchier than normal oatmeal but softer than a crumble. Can't wait to try it! 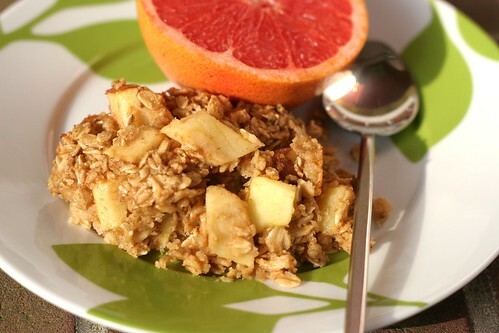 I'm an oatmeal lover...and baked oatmeal is even better..it hits all the right caramel-y and toasty notes! Yours looks just lovely! oh my, this looks so yummy! 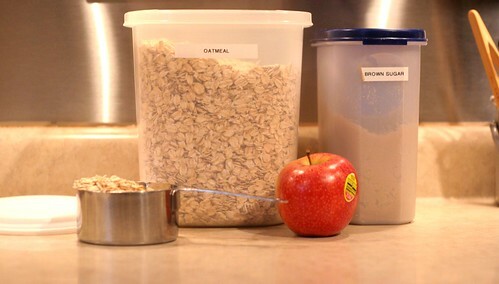 i love apple, cinnamon AND oatmeal! How have I never heard of this before? I might make this right now...ok no, I'll wait til the morning. Yummo!! Thank you everyone!! It isn't too sweet, which I like. But if you find that it's not sweet enough I would drizzle honey on top of each serving. Also - a great way to cut even more calories: substitute half of the butter for applesauce. If you try it, let me know! This is in the oven at this very moment. I didn't have any apples, but I couldn't wait. Question: Does it reheat well? Also, why don't you open your own adorable little coffee shop? Thanks, Gillie! I hope you like it. If it's too bland without apples, just add some honey or raisins! It does reheat well! I've been eating the leftovers for breakfast this week. I put some in a bowl, sprinkle just a little bit of water on top and microwave it for 30 seconds. The water helps it not get too dry. Also - I both love and hate the idea of a coffee shop. Haha! I know I would love baking and coming up with things to make. But it also sounds stressful and there is a huge initial investment. I'm actually hoping to teach someday! Maybe in 5 years when I am home with babies, I can put together baking or cooking classes to teach from my home for a little extra income. 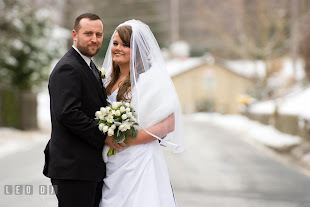 I'm not really sure where this whole blog thing will lead, but I've been enjoying it so much!